Hi, my name's Quaid and I've been collecting ponies since I was a kid (just g1). I have pretty much always liked MLP, but I get into it more at different times. I live in Utah and I'm 25 years old. I'm not sure exactly what kind of info to put on here, but I go to the University of Utah where I will be graduating with my Bachelor's degree in Spanish and a TESOL certificate (Teaching English as a second language). My 2 favorite ponies are Masquerade and Whizzer, but I love all of the twinkle-eyed ponies and also the so soft ponies (but the versions without the fuzz, so I've been learning how to de-flock). I have some of my favorite ponies on display all the time, so they're always at least somewhat on my mind, but I've recently gotten even more excited for MLP again when I found out that they were being re-released (35th anniversary), so I went out and bought the majority of them. If I wasn't clear on anything or if anyone has any questions I'd be happy to answer or clarify! I'm excited to get to know you guys and have great convos! Welcome to the TP! Let us know if you have any questions as you learn your way around. Are you planning on working abroad once you have your degree? Spanish is my second language, I grew up in a bilingual home. Fun fact, when I was little, I would read my English book but dictate it aloud in Spanish. I remember my grade 1 teacher questioning my Mom about that at parent teacher nights. Lol!!! I was an interesting child. Welcome! Congrats on your upcoming graduation! I've been trying to use Duolingo to pick up on Spanish again (haven't taken a course since junior high). Welcome, welcome. Spanish is my first language. 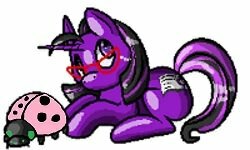 I find it awesome for others to be learning Spanish and are also pony fans. Yay!